If you should come across a leveret that apparently looks like they have been abandoned PLEASE DO NOT TOUCH THEM. It is quite natural for leverets, even as young as a few days old, to be left unattended for long periods of time. Unlike rabbits, leverets are born and live above the ground and so are very vulnerable. The mother will visit her leverets to feed them once or maybe twice a day usually early morning and at dusk. 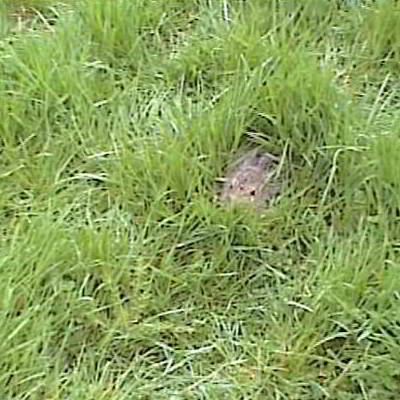 During the rest of the day the leveret will remain very still so as to be undetected by predators. When a hare is resting it uses what is called a Form. This 'Form' is constructed by scraping at the earth to produce a shallow hollow deep enough for the hare to nestle down in. This and long ground cover provides cover whilst still enabling the hare to have a view of it's surroundings and an unrestricted space to bolt from. They will nestle down close to the earth with as much ground cover as conditions allow so unless they are injured or have been disturbed from their form it is unlikely that you would see them. It is very unwise to pick up a leveret just to have a closer look as the mother may abandon her leveret if she were to detect an unfamiliar scent on him however, should you come across a leveret with obvious injuries you may have to remove it and seek help and advice as soon as possible from a wildlife friendly vet and or from someone with experience. If you do happen to see one, observe it from a distance, maybe he was just moving about or your footfall frightened him into moving. Without touching him remain still to give him a chance to move and hide himself again. If he is not injured, doesn't move away but just freezes and is in an exposed or dangerous position you may have to move him to safety. You cannot allow your scent on him, even your gloves or clothing will carry your scent. Rub your hands thoroughly in the grass/ground cover then pull up chunks of the ground cover. Using the grass only to make contact with the leveret, gently touch him to encourage him to move into the ground cover. If he wont then gently sandwich him between handfuls of ground cover lift him only a short height and quickly put him in the long ground cover. Walk away and leave him. Don't draw attention to him if there are other people about. You may use this method if when cutting your lawn or an overgrown area. If you find or suspect that there are leverets nesting there please take care and give them a chance, depending on their size they may move if gently touched with a small branch or similar. Hand rearing leverets is not an option to take on lightly. Even in a pair of experienced hands, the procedure can be fraught with problems. For advice you can contact me or one of the Wildlife Rescue Centres up and down the country, check on line for your nearest.